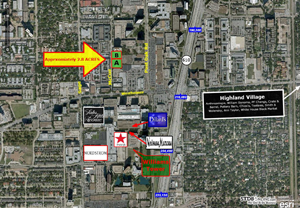 2525 McCue Rd., Houston, TX, a 2.85 acre piece of land located in the heart of the Galleria submarket was owned by Austin developer, Faulkner USA, for planned future development of high rise office building, resort or hotel in accordance with proper timing of market demand. After the real estate market took a turn for the worst in 2008, Faulkner USA had a change of plans and decided to list this Property given that the right Buyer, price and terms could be achieved. Originally the owner tried to list and Sell the Property with one of the largest commercial real estate firms in the world. After a little over a year the property had not sold or been under contract. At the expiration of the listing Drake Realty Group obtained a listing agreement took and over the responsibility for the disposition of the asset. The approach was unique and entailed aggressive front end problem solving and marketing. Current Market demand, lack of new development activity and uncertain market conditions due to the real estate crash. Price point and ‘Highest and Best Use’ disconnect between Seller and Market. No Impervious Cover, Sanitary Sewer and Water Capacity existed to the Property. No Detention Waivers from Harris County existed for the Property. Aggressive time horizon expectations for disposition at the highest price. Solve all pre-contract and pre-development issues surrounding the property to maximize density and price for Tier 1 Buyers and Developers and ensure closing. Overcome and solve Buyer / Seller disconnect caused by current Market conditions. Detailed Market research and analysis of the subject property, i.e., competing sites and market demand. “Highest and Best Use” analysis of the property with respective purchase price thresholds for each Use. Market rent and sale analysis for most likely End Users / Buyers, i.e., Office, Multifamily, Condos and Hotel. Provided a Broker opinion of value and market trends analysis. Created demographics and psychographic reports of the trade area, traffic counts around the property and employment base research for prospective Buyers (for Seller and Prospective Buyer(s). Created detailed offering memorandum / sales packages to present to the Marketplace on a Statewide and National platform. Brought in top engineers for due diligence review of all issues pertaining to the Property. Solved Impervious Cover, Detention Waiver, and Sanitary Sewer and Water Capacity issues between the Sellers property and the City of Houston: Through our front end internal analysis of 2525 McCue Rd. we were able to uncover several issues with the assistance of a local engineering firm. These problems had never been brought to the Sellers attention and could have kept the Property from being sold at all, or sold close to the asking price. Through research and determination we were able to obtain a Detention Waiver letter from the City of Houston, which isn’t common, bringing the sites impervious cover back to the original 91% which existed when the site contained an old apartment complex (The Marquee) still on the Property prior to Faulkner’s ownership. The savings to the Seller was estimated to be $1.3 million in potential lost value if a detention pond would have been required by a new Buyer and adjusted into the Sales Price. In addition we were able to obtain Sanitary Sewer and Water Capacity letters needed from the City of Houston in order to keep a prospective Buyer from exiting the contract during due diligence or any unforeseen development costs arising prior to a closing. Marketed 2525 McCue Rd. via aggressive marketing campaigns and strategic end user identification to our Texas and National database of Developers, Buyers, Investors and Brokers. Face-to-face selling and presentations to select targeted end user / developers of Office, Multifamily, Condo and Hotel assets and Brokers for same. Cold calling campaign to specific prospective Buyers. LOI and contract negotiations for Buyer and Seller, contract milestones management (timeline spreadsheets) for Buyer and Seller, communications with Title Company to ensure details and deadlines are met by both Buyer and Seller. Detailed closing statement review and analysis for Seller and Buyer. Weekly / daily follow up emails and calls with Seller and Buyer until closing. Drake Realty Group obtained the listing, created a custom marketing campaign and was able to Sell 2525 McCue Rd. for one of the highest historical land prices at that time in the Galleria submarket. 2525 McCue Rd. had its first contract offer within the first 30 days of a signed listing agreement and was under contract within 60 days. The Property closed in May, 2011 to one of the largest multifamily developers in the Nation with great success, and is now a premier Infill luxury multifamily 5-story wrap development 750 ft.’ from the front door of the Galleria and adjacent to BBVA’s new Corp offices on Post Oak Bvld. Read more about our land disposition and development services. For information about how Drake Realty Group’s land disposition services can help you achieve the highest and best use and maximize your ROI, contact us.